With the Premier League currently having its second international break of the season, just who have been the star performers in the top flight so far? A trio of teams - Manchester City, Chelsea and Liverpool - are level at the top on 20 points after eight matches and it's the Blues winger Eden Hazard who tops Sky Sports Power Ranking stats so far this season. The stats are based on points awarded to players for 33 different statistics - from goals and assists to blocks and tackles. Goalkeepers, defenders, midfielders and forwards receive a different number of points for certain achievements - with a defender awarded more points for scoring a goal than a forward for example. Players are also awarded points for categories including successful passes, touches, tackles, shots on target and blocks but can lose points for errors leading to goals, own goals, yellow cards, red cards and goals conceded. Hazard is the Premier League's top-scorer with seven goals and has so far earned 22,168 points. He is well clear of Everton midfielder Gylfi Sigurdsson, who is second with 17,942 points. Manchester City duo Raheem Sterling and Sergio Aguero are next with 17,720 and 17,535 points respectively. Arsenal striker Alexandre Lacazette is fifth with 15,938 points, just ahead of Liverpool's Sadio Mane (15,645) and Leicester's James Maddison (15,544). The top defender is Watford's Jose Holebas, who is tenth overall with 14,177. Manchester City's Ederson is the top-rated goalkeeper, with 13,930 points. He is 12th overall. 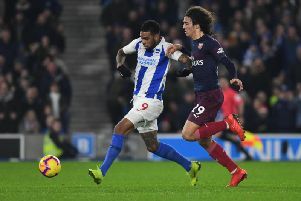 The top rated player for Brighton is Anthony Knockaert, who is 42nd overall, with 11,606 points. He has netted one goal and provided three assists for the Seagulls so far this season. In the Power Rankings in-form chart, based on the last five matches, Sigurdsson is top with 10,742 points, just ahead of Lacazette (9,637), Hazard (9,598) and Wolves defender Matt Doherty (8,930). Knockaert is 27th in the list with 5,019 points.